Most of our decisions each day can be categorized as choices that either support life or death. For our relationships, spiritual walk, physical or mental health. As I was thinking about this last week, I began thinking through what choosing life or choosing death might look like in our lives. Choosing life might look like tending to our marriage, putting our child’s needs first or making space to take care of ourself. Choosing life might be letting go of a certain someone, praying, getting out into nature or drinking a green smoothie. Choosing death might look like ignoring a loved one’s plea, believing a lie about ourself or numbing ourself from something painful. Choosing death might be not answering the door when a friend stops by, not showing up for work or canceling the doctor appointment you know you need. 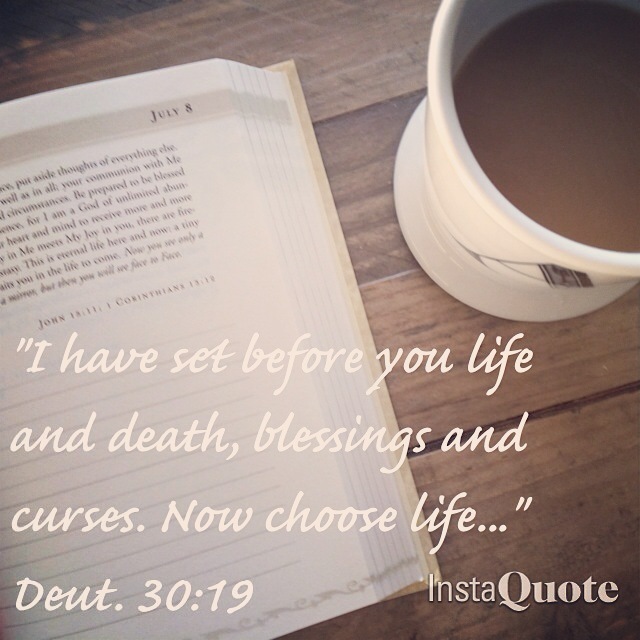 I have set before you life and death, blessings and curses. Now choose life, so that you and your children may live and that you may love the Lord your God, listen to his voice, and hold fast to him. For the Lord is your life, and he will give you many years in the land he swore to give to your fathers, Abraham, Isaac and Jacob. These verses remind me of when I was struggling in my eating disorder. So much of why I struggled with food and body image was because I was believing the lie that I’m not good enough. Through my eyes, I was a constant failure. I couldn’t see that so much of my pain and suffering was due to the verbal abuse of my (eventual ex-) boyfriend. My eating disorder got so out of control that I was confronted multiple times by my family and friends and even had a close brush with death. I remember my mom very soberly telling me that I needed to, quite literally, choose between life and death. I struggled with my eating disorder off and on for a few years, while still remaining in that unhealthy relationship. And by then, only a shell of who I used to be remained. When we finally broke up, even though I was clouded by pain, I knew in my heart I was faced with the very same choice my mom had presented to me previously: was I going to choose life or death? Thank God, I chose life. When you’ve experienced being as broken as I was, choosing life is a long journey. In the beginning, I didn’t like myself nor was I comfortable with myself… I didn’t know who I was any more. I felt like a lost soul with no internal identity. What was I passionate about? What were my own opinions on things? What made me feel loved? When did I sense God near? Every time I felt my old patterns and unhealthy habits creeping in I would think, “Oh, I’ve been here before and I don’t want to go back. I want to live!” One after another, I intentionally made choices that supported life. And little by little those choices started adding up. Over the course of about four years, I could look back at where I had come from and see how dramatically God had rescued me and changed me. Today, I am still faced with times when the choice between life or death is relevant. Even though it’s difficult to admit, pursuing writing again has brought some of my insecurities of not being adequate or enough to the forefront. Through the writing process, I am being confronted by my weaknesses and fears and it’s uncomfortable. So much of me wants to burry these old lies and fears… but I’ve been at this crossroads before. Will I choose life or death? Death would be to stop writing, to sweep my struggles under the rug and do something easier. Whereas, writing brings life and healing. My choices don’t look quite as radical as they used to, but they still hold the power to propel me into either healthy or unhealthy waters – whether that be physically, mentally, emotionally or spiritually. Acknowledging that I’m still tempted at times to believe the old lie that I’m not good enough. Rejecting this lie when I realize it’s filling my mind, affecting my actions or altering my emotions. Choosing life is being kind to myself rather than being an enemy to myself. It’s tending to my whole being. And even though I’m far from perfect at it and some days it seems like it would be easier to choose the opposite, I am committed to choosing life. What choice are you faced with today between life and death (either mentally, emotionally, physically or spiritually)? What would it look like for you to choose life?